Some paintings know what they are before I begin them. Others reveal themselves to me along the way. This one changed identities. It wasn't always Interlaken. I had to wait to find that out. Begun in my studio with the view of the Seattle Steam building in Pioneer Square, it started out as something to do with the universe and a giant explosion. It was black and green (I wasn't sure why) and flying apart, and it was horizontal, too. 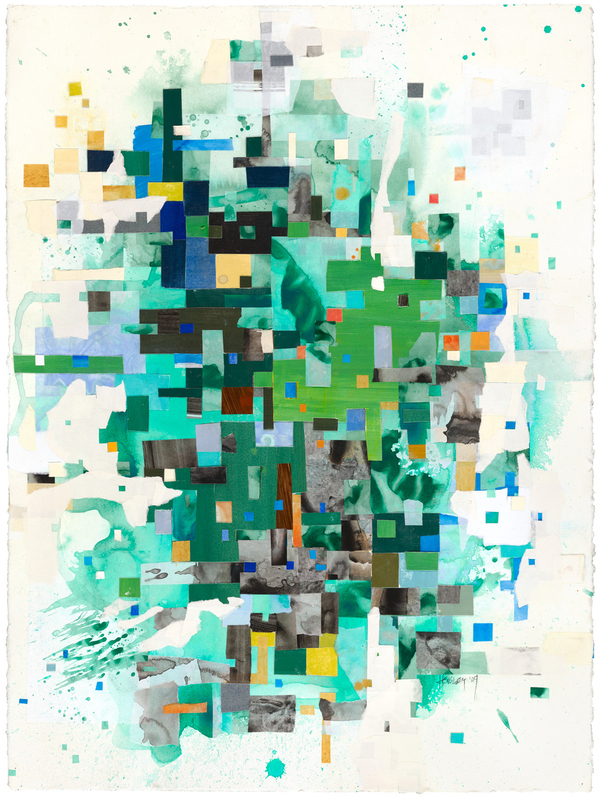 But it wasn't settling - and neither, it turns out, was I.
I moved from that studio and from my place in Fremont, and in my bright new home studio with a view of Lake Union, I pulled out the green and black piece, turned it vertically, and began to work on it again. At the time, I had not ridden my bike in over a year. A reminder of a recently ended marriage, it simply didn't allow itself to be ridden, let alone washed. It was still spattered with the mud of a winter ago. Then one fresh March day I woke up thinking, "I'm going for a ride". I got dressed in the most outlandish cycling gear I could come up with, grabbed my dirty bike and headed out the door. Finding new routes from my new neighborhood, I gleefully pummeled up and flew down all the hills I could find, ones I'd never done before - why not?? and on the way home, I found myself on Interlaken. Interlaken is one of the loveliest boulevards in Seattle. An Olmsted Brothers creation that winds up the north side of Capitol Hill through acres of giant ferns and cedars and Doug firs and redwoods, up to Volunteer Park and the Seattle Asian Art Museum, it turns out it was designed with bicycles in mind, back in 1890. I just discovered this, to my delight. The new low-wheeled machines had recently begun to replace the old-fashioned high-wheelers, which made riding up hills a whole lot easier. It used to be a place I visited rarely. I had been on it maybe five times in all my years in Seattle. Now, here I found myself living not far from it. It was "my" park! Riding into the park and out of traffic, I heaved a sigh and shrugged off the city as I glimpsed water and sky from inside the trees. The greenness was intense that day, and subsequent days all through the spring, with dots of bright flowers, asphalt dark with recent rain and those white glimpses through the branches as I climbed the winding hill. Over the next months it would become a daily part of my new ride route, part of my new life. And so, working in the studio one day, looking for direction on the green collage, all at once there it was: Interlaken. It surprised me. While all of my works, for years, have had specific place names or references to physical places, the new collage paintings were all about internal landscapes and emotions. This one was simultaneously external and internal, and suddenly I knew why it was black and green.